In this telecourse recording, you will learn and practice self-awareness skills to fine tune your attention to met needs; savoring feelings of well-being; expressing these feelings to others; and receiving other people's messages of joy, gratitude, inspiration and more! Expressing ourselves honestly is sometimes scary because we can't predict where the conversation will go after we've made ourselves vulnerable. This recording will demonstrate how the power of our honesty is enhanced by ending on a clear and present request. Jim leads a self connection exercise focused on how our lives are interwoven with people we love, acquaintances, people unknown to us, and even those who have come before us or will come after us. Jim and Jori offer practical tools to help us develop patience through a process they call WAIT: Wake up, Accept, Insight, Take a step. 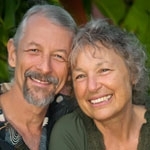 Jim and Jori discuss sharing power through exploring our experience of having and not having power, how we make choices about our power and examining our relationship to power itself. In this introductory audio with CNVC Certified Trainers, Jim and Jori Manske, you will learn the difference between an observation and an evaluation, and how discerning between the two improves your ability to stay present in the moment. Included are daily practices for developing your observational skills. Join CNVC Certified Trainer Jori Manske in an exploration of how gratitude can enable you to remain more present moment to moment, thus enabling you to flourish in your life! Learn how to use NVC consciousness to cultivate vitality, wake up your life and re-map your old patterns by blending NVC with the Positive Psychology work of Martin Seligman.